The macula of the eye is located at the optical center of the retina, which is the projection point of the visual axis. The most sensitive part of the central vision is the macula. The macula determines the sensitivity and accuracy of the human visual acuity. Retinal macular degeneration will lead to a significant reduction in visual acuity, even blindness. Diabetic retinopathy is one of the most important causes of blindness in the world. According to findings of the eye disease research team, millions of people in the United States have diabetic retinopathy. Research also shows that with diabetic retinopathy. The occurrence of macular edema may also be accompanied by diabetic macular edema. Due to its advantages of non-invasive, non-invasive, non-invasive, high-resolution, high detection sensitivity, and safe and efficient image acquisition, OCT is widely used for imaging of tissues such as the retina and superficial skin, and has been particularly changed in the field of ophthalmic diagnosis, which is getting more and more important. OCT can achieve micron axial resolution and has the ability to diagnose and identify eye diseases such as glaucoma, macular hole, age-related macular degeneration, diabetic retinopathy and macular edema. Doctors can judge the severity of retinopathy by the size of cystoid edema. 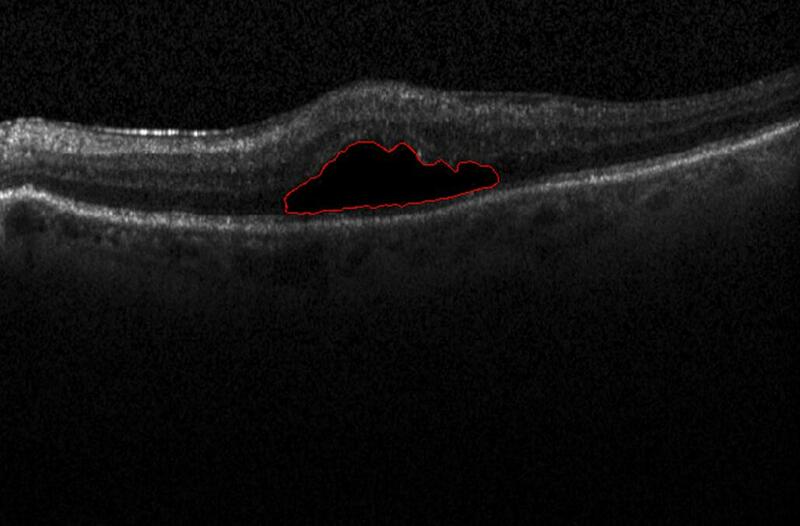 Although ophthalmologists can diagnose patients with cystoid edema through OCT images, quantitative analysis of the lesion area is very difficult. The doctor needs to manually mark edema areas which are marked on the OCT section of the fundus and are prone to errors. In addition, the OCT fundus data for each patient are very large. These works are undoubtedly time-consuming and labor-intensive. Therefore, the team proposed an automatic algorithm that can segment the cystoid edema area and provide parameters such as the volume of cystoid edema to provide a quantitative analysis tool for later clinical diagnosis and treatment. Research team of associate professor Chen Minghui from Institute of Biomedical optics & Optometry, Shanghai Institute for Minimally Invasive Therapy, University of Shanghai for Science and Technology, has been devoted to long-term research in optical coherence tomography and application in biomedical optics. The light source of the coherence tomography system is constructed and applied to biological tissues, the image denoising algorithm after imaging, the image segmentation algorithm after imaging, and the main research results of the image segmentation algorithm are as follows, and a method for segmenting diabetes in OCT images is proposed. The method of macular edema can complete the segmentation with a relatively small amount of calculation and at a faster speed, and can segment a smaller edema region. The result of the algorithm segmentation is compared with the result of the artificial segmentation. The experimental results show that the segmentation of cystoid edema is accurate. Degree, sensitivity, and Dice similarity coefficients were 81.12%, 86.90%, and 80.05%, respectively, and the edema region was well segmented. Finally, the area of the edema region was also calculated, and the segmentation accuracy was high, which can be used as a later clinical diagnosis treatment, which provides qualitative and quantitative tools. Research team of associate professor Chen Minghui from Institute of Biomedical optics & Optometry, Shanghai Institute for Minimally Invasive Therapy, University of Shanghai for Science and Technology, in the past decade has been devoted to the research of medical optical coherence tomography (OCT) real-time imaging technology, and developed devices and instruments such as swept lasers, which are used in optical coherence tomography systems. Research spectroscopic diagnostic techniques, especially in fluorescence spectroscopy, fluorescence lifetimes, and other diseases such as cancer. Research directions include endoscopic imaging research, medical laser instrument development, spectral diagnostic detection technology research, medical optical imaging research. The team cooperated with the Shanghai Institute of Optics and Mechanics, Changhai Hospital, and Shanghai Aupu Biopharmaceutical Co., Ltd. of the Chinese Academy of Sciences. In the past two years, the team has published more than 20 articles in domestic and foreign journals and applied for more than 10 invention patents. He Jintao, Chen Minghui, Jia Wenyu, et al. Segmentation of diabetic macular edema in OCT retinal images[J]. Opto-Electronic Engineering, 2018, 45(7): 170605.